Why have a Worm Farm to compost organic wastes? Composting at home is the most sustainable way to manage organic wastes. The Christchurch City Council promotes home composting through such activities as subsidized worm farms into Schools and Preschools, and free talks on composting. 1. Making your own organic fertiliser saves money and reduces water pollution. Compost is a soil conditioner; worm-improved compost is a slow release fertiliser and biostimulant as well. By composting with worms, you can make your own high value organic fertilisers, and replace or reduce your use of store-bought products. This saves you money. Many high-analysis fertilisers are water soluble products that leach out of the soil profile into ground water and rivers. This nutrient-rich run-off leads to algae bloom, suffocating waterways with an organic pollution. Using less of this kind of fertiliser means reducing the nutrient-rich waste that pollutes waterways. 2. Being part of the solution is empowering. It FEELS GOOD to be Green!!! Composting at home is a "think global, act local" activity. It�s empowering to DO something so fabulous for the environment. Working with earthly delights such as worms, soil and compost can reduce stress, and that�s empowering too. By being a model for the children, you are part of the solution �now and in the future. 3. Grow healthy plants and healthy people. Using compost in the garden will improve the soil, which will improve the plant, and eventually improve the health of any animal that eats that plant. Healthy Soils = Healthy Plants = Healthy People. Plants grown in a soil with high organic matter content and biological activity will mobilize minerals more effectively to the plant. That means plants will grow stronger, be more nutritious, be more disease and pest tolerant, and be more drought tolerant. But don't just take my word for it. Read Arden Andersen, Charles Walters, David Murphy, Willam Albrecht, Remineralize the Earth.com, CXXXX. Organic NZ � Soil & Health Association of New Zealand, USA's Tilth. 4. Reduce need for landfill space. According to the Christchurch City Council, 46% of what goes to the landfill can be composted (green waste and kitchen scraps) and another 26% is paper/cardboard (which worms can recycle). In 2005 that 46% of landfill waste measured nearly 74,000 TONNES to Kate Valley from Christchurch. That's 74,000,000 kgs. If we did not fill Kate Valley landfill up with this waste, it would not fill up so quickly, and would not have to be replaced so soon. 5. Save on the fuel used to transport waste to the landfill. Transporting waste uses a lot of fuel. Sure, the programe employs a lot of people, and has made a few people very very rich. But, That not a good reason to cart waste out of town by vehicle. Transporting waste takes a lot of fuel, and when fuel is becoming a scarce commodity, such overt wastage will cost the ratepayer � everyone � directly and indirectly. Ever see those spiffy blue truck and trailers going down the highway..., every day, every hour, wearing down the roads. There's got to be a better way. Um... isn't there a really cool set of railroad tracks just meters away, begging for a spur? 6. Save money on kerbside bags. Okay, perhaps it�s not a lot of money in your pocket saved, at a $1 per bag. But it�s something, and behind every bag not used, there�s less labour going into picking it up and handling it. Less labour costs will eventually trickle down to some cost savings. The future kerbside pickup programme will cost every ratepayer $150 annually � a bargain really. But that price will climb as time goes on. 7. Raises awareness which leads to reduction in consumption. Bear with me here. I've been told many times by my customers that when a household introduces composting (with worms in particular), they found themselves buying less, and buying differently. Suddenly, they see how much plastic packaging surrounds their purchases, and they start to buy less. They started to think, hey... the worms will eat that paper cup, so why choose the Styrofoam cup. Same goes with packaging � once a family sees how much a worm will process in the worm farm, they tend to buy less packaging. Perhaps pack the kid's lunches differently. Many of my customers report a significant reduction in the number of bags they put to the kerbside per month. One preschool I worked with went from 2 huge wheelie bins per week to only 1 wheelie bin per month - WOW! On a personal note, I went from one bag per week, to one per month. 8. Less methane production means less greenhouse gas. Methane is one of the worst green house gases, and it's produced when food breaksdown in a landfill. A greenhouse gas traps heat from the sun, and like a green house, the atmosphere heats up. Methane lasts in the atmosphere 12 years. By composting with worms, you do not create much methane from the breakdown of organic matter, so you are generating less greenhouse gas. Composting is fun - it�s magic. My son (who is not an earthy kid and prefers computers to plants) said to me once, after watching buckets of food scraps disappear in the worm farm, he said "gee mom, there really is life after death". Well I knew right then I was doing the right thing, all this playing with worms stuff. 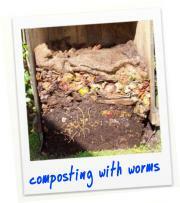 Composting with worm is easy. If you find it doesn't work, often it's because of the system you have is too hard; it's not you. Choosing a size that fits your goals is crucial. Remember, it takes 20,000 worms to recycle for a family of four, so you need to start with a system that can house that many worms. 10. Reverses global warming by locking carbon back into the soil. Matter is neither created nor destroyed. When we burn fossil fuels, we take carbon from the soil and turn it into a gas, a greenhouse gas. That gas is unstable up there in the atmosphere, causing the atmosphere to heat up. By converting organic matter into vermicast, we have effectively created a concentrated carbon. Then when we bury it in the soil, we lock it back into the system, in a stable element. Scientist call this "carbon sequestering". Vermicast is the product of composting with worms. It's rich in humic acid, which is concentrated carbon.